Visual Communication for the Mass Media (JOUR 390) is a class typically taken by sophomores and juniors. It focuses on providing students with multimedia skills in the critical Adobe Creative Suite programs. This class recognizes that a successful communications professional in the 21st century must be multidimensional and possess a variety of skills. This means students are learning how to design logos, newspapers, magazines, and even online portfolios. By the end of the class, students will have their own professional website with a fleshed out portfolio that they can use as they search for internships and jobs in their field. JOUR 390 focuses on the theories of visual communication as well. Students will understand and analyze color, harmony and type set in order to effectively communicate information. This class focuses on not just the how, but also the why of visual communication. In JOUR 390, Edelman focused on the topic he’s most passionate about, sports. 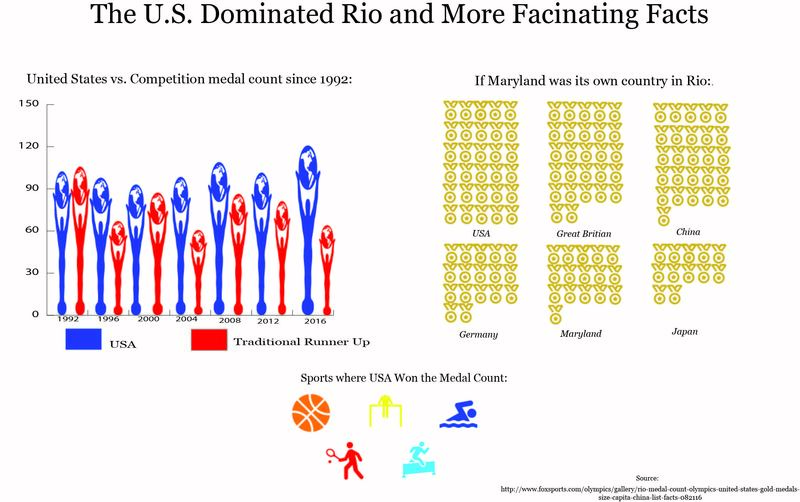 He created an infographic featuring stats from the 2016 Olympics.